I enjoy being outside, exercise and eating - especially sweets. 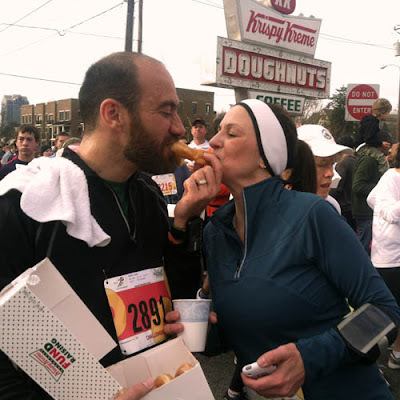 Since 2004, on the 1st Saturday of February these pleasures are all unified in Raleigh's annual Krispy Kreme Challenge. So last Saturday - early (very early) I was joined by my wife, a co-worker and 7,500 others at the NCSU Bell Tower to run 2.5 miles, devour a dozen Krispy Kremes doughnuts then run another 2.5 back - in under 1 hour. That's 2,400 calories of good ole deep fried glazed dough in the middle of a 5 mile sprint. In past years I've never tried to eat the dozen. Each time I felt like I could have - so this year (my 4th, 1st run was in 2009 and was worthy of it's own blog post) it was time to answer that question and put my donuts where my mouth - the whole dozen - and did it. While my running pace was pretty good for me (thanks to a lot of lunch-time runs w/ co-workers), my doughnut eating pace wasn't quite at the pro-level. I clocked in just under 1 hour 6 mins. Had the course not been extended this year, I would have had it. And for the record - the doughnuts stayed down! Next - Raleigh's St. Patty's 8k Green Run - March 3rd. First 2000 to finish, get a free beer. How's that for motivation? For some great photos, see these that another co-worker captured.